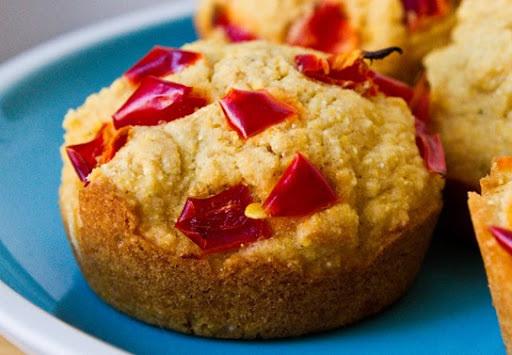 Buttery Maple Corn Muffins. Vegan Recipe and Tips! 1) What about the eggs? 2) My batter looks too watery! 3) How will I get them fluffy? 4) Corn Meal vs. Corn Flour vs. Masa Harina? 5) Do I need Corn? 1) Eggs? 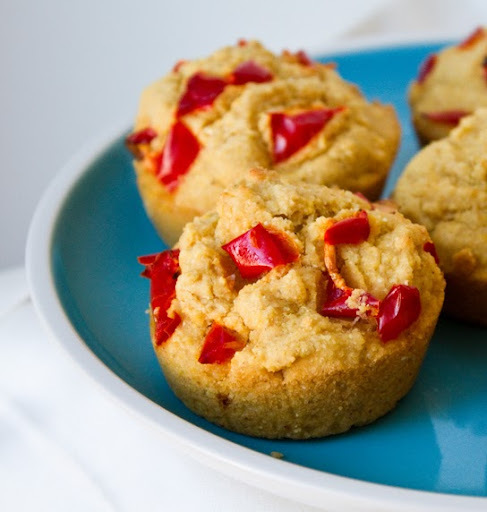 You don't need eggs for corn muffins. Really, you don't need them. Corn is such a hearty, stand-up ingredient that when you blend it with liquids it really becomes its very own "egg replacer". 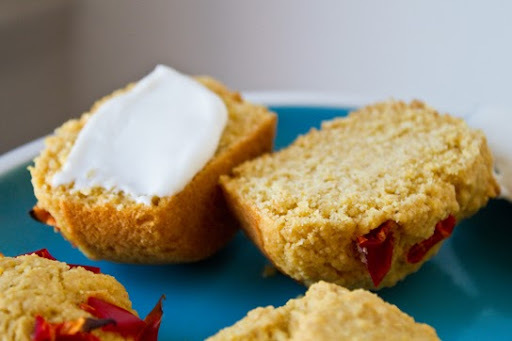 You can also add further ingredients like canned corn, corn puree, silken tofu and even plain old applesauce to give your corn muffins a bit more body and texture - without the eggs. See, good texture without the eggs..
2) Batter Consistency? 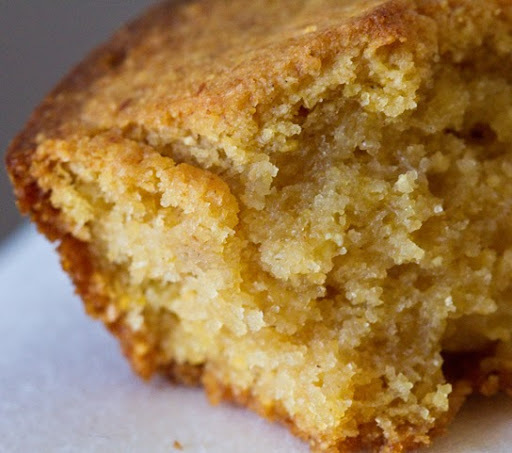 Corn muffins were one of the very first recipes I made back as a teenager. But I found that sometimes my muffins would come out a bit drier and grainier than I desired. Eventually I found that if I made my corn muffin batter look a tad on the 'watery' side (compared to say, blueberry or banana muffin batter) - the muffins would bake up perfectly moist. The cornmeal absorbs so much excess liquid during the cooking process - so it is OK (and better actually) to have your batter a tad on the 'watery' side. 3) Fluff factor. Well I want my muffins to 'rise' so I'll just add double the baking powder/soda - right? Wrong! I've experimented with this logical decision - but the muffins acquire a tangy - metallic flavor from too much baking powder/soda - and the extra fluffiness is very minimal. Quite frankly, I like my corn muffins dense and moist. 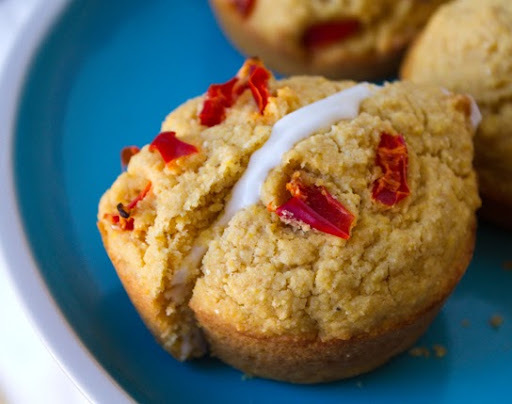 You don't need a corn muffin to be ultra fluffy to taste delicious. So don't worry about the fluff factor - and stick to worrying about the moistness factor. 4) Corn Flour, Meal, Masa? OK, it's easier than it sounds. Corn flour is just what it sounds like. A fine flour made from corn instead of say, wheat. Corn meal is a grittier version of corn flour. Both are made from corn, but meal is less refined. Masa Harina pertains more to the process in which it is made - since yes, it is also a flour-like corn substance. But Masa Harina is usually treated with lime during processing. Masa Harina is used to make homemade tortillas and tamales. I personally like to use a touch of Masa Harina to my corn breads because I find it adds a very silky texture and authentic taste. 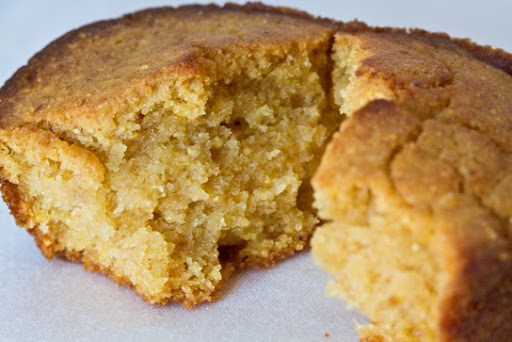 Corn meal is the traditional cornbread "must-have" ingredient - while corn 'flour' is too fine to really produce an authentic cornbread on its own. 5) Don't I need to add corn? 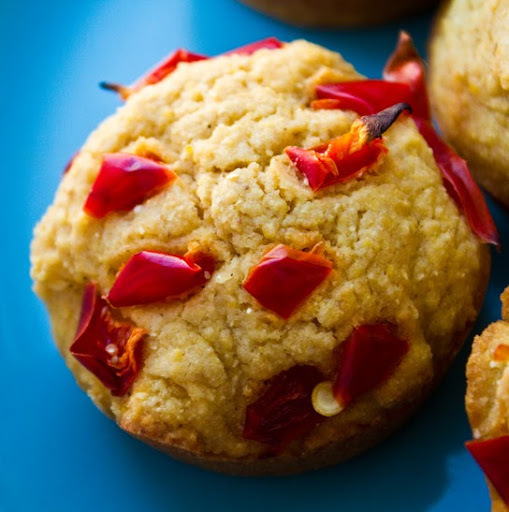 No, you don't need to add actual corn to make corn muffins. 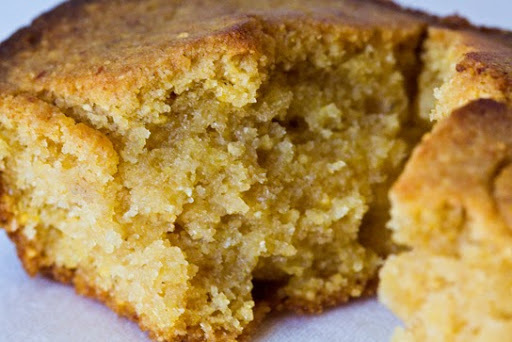 Yes, you may usually add bananas to banana bread - and carrots to carrot cake - but you really don't need to add whole corn to corn bread. But you certainly can. 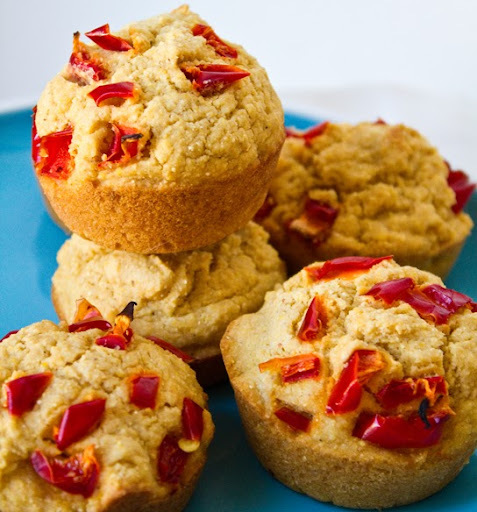 Adding canned corn or corn puree will moisten the baked muffins and add complexity to the texture. You can also add optional fold-ins like diced peppers, jalapenos, grated vegan cheese, nutritional yeast, onions and more. Corn Nutrition Facts! If you want to add corn to this recipe - go ahead. Corn is a healthy veggie that is sweetly satisfying. 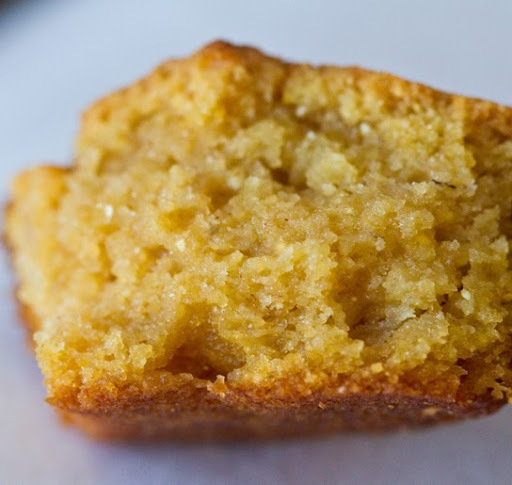 This recipe makes a very buttery, delicious corn muffin. There is a good amount of vegan butter in these muffins - but the way I look at it - I don't need to 'spread vegan butter' on these muffins. They are so delicious to eat as-is. The buttery, moist flavor is baked-inside, rather than 'spread on'. 2. In a mixing bowl, add the dry ingredients and toss well. Then add in the liquids. Fold until a nice batter forms. Remember, even if you think the batter is a bit on the watery side - those corn meal granules will work to absorb excess liquid in the oven. 4. Bake at 375 degrees for 30 minutes - or until edges become browned. Cool. Serve warm for best taste results. a little optional Vegenaise spread inside..